You know the voice. He started that “and that’s another. . . Cards first down” thing at Papa John’s Cardinal Stadium. 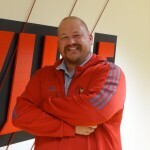 Sean Moth also plays an important role in the way the University of Louisville athletic department is presented to the public, and he clearly loves his job. Get to know the Colorado native and listen as I pick up some advice on how to get more excited about the Rusty Satellite Show. 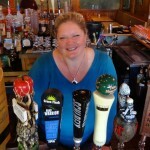 And I’m learning a lot about beer doing this show, but have run across no one with more information on the beverage than Tish Gainey, the beverage manager for Buckhead Mountain Grill and Rocky’s. Listen up to find out how you can win in the first-ever Listener contest at the Rusty Satellite Show. Here’s a link to Buckhead’s Beer App. In the news, I’m talking politics and the local judges races, and tell you how it’s going with my journaling project with my son Luke. And there’s my Twitter post that got a lot of reaction from Big Blue Nation. And I’m homeless – hear about my experience with the airbnb web site. All in another great episode of The Rusty Satellite Show.